European Union offers a raft of financial, diplomatic incentives in pursuit of 'two-state solution'. The European Union on Monday pledged "unprecedented" levels of support to both Israel and the Palestinian Authority in the event that the two parties reach a final status agreement which would include the establishment of a Palestinian Arab state in Judea and Samaria, along with the ethnic-cleansing of at least 100,000 Jews in communities throughout the region. "In the event of a final peace agreement the European Union will offer Israel and the future state of Palestine a Special Privileged Partnership [the highest level of recognition the union can confer on non-member states - ed.] including increased access to the European markets, closer cultural and scientific links, facilitation of trade and investments as well as promotion of business to business relations. 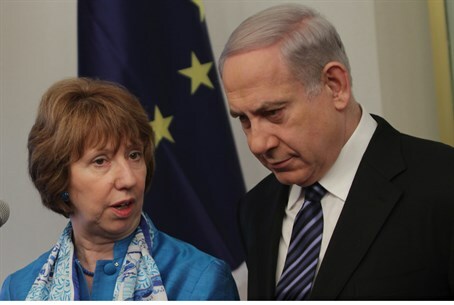 A senior EU official said it was too early to talk about numbers after Israeli daily Haaretz last week claimed the package would be worth "billions of euros". The left-wing paper also said it could help to end what it termed as "Israel's international isolation" - apparently ignoring the already-burgeoning Israel-EU trade relations, which hit 29.4 billion Euros in 2011. The offer is apparently being formulated by British Foreign Secretary William Hague together with his French, German, Spanish and Italian counterparts, and follows a compromise deal between Israel and the EU which allowed the Jewish state to take part in the "Horizon 2020" European scientific collaboration project. The joint project was thrown in jeopardy by new EU guidelines that boycott Israeli entities over the 1949 Armistice line. It comes after revelations that EU funds were being squandered in Gaza by paying Palestinian Authority employees who were not actually working, raising questions about the uses and efficacy of EU funds.